PHOENIX — Under pressure by animal welfare groups and many of his own people, the president of the Navajo Nation, Ben Shelly, has reversed his stance on horse slaughtering, saying he will no longer support it and will order the temporary suspension of the roundups of feral horses on the reservation. The agreement, brokered by Bill Richardson, the former governor of New Mexico, is scheduled to be announced on Tuesday. 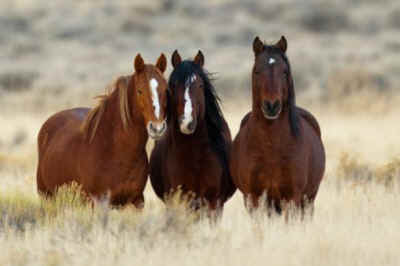 One of its key provisions is to pressure the federal government to do more to help the Navajos handle the tens of thousands of horses that roam freely on their land. Mr. Shelly has estimated that feral horses cost the Navajos $200,000 a year in damage to property and range. Mr. Shelly’s recalibrated position is sure to strengthen the arguments against horse slaughter in the nation, just as a legal fight to block the opening of horse slaughterhouses in New Mexico and Missouri reaches its final stages. It could also smooth relations between his administration and tribal elders in some of the Navajo Nation’s largest chapters, who have stood steadfastly against the roundups even as Mr. Shelly embraced them in August as the best available option, given the tribe’s limited resources, to keep its feral horse population under control. In a unanimous vote last month, the Navajo Nation chapter in Shiprock, N.M., banned horse roundups in its territory. The chapter’s president, Duane Yazzie, said members were concerned about the abandoned colts and the sale of the horses to meat plants in Mexico, where slaughter is legal. The Navajos estimate there are 75,000 feral horses roaming the reservation, an estimate based on aerial observations, a method they concede is unreliable. One of the points of the agreement is to find a way to take an accurate count.